We can't be the only ones who at the end of a major take deep breaths and can barely be arsed to think about tennis for a few days, can we? A bit of travel, plus some important non-tennis stuff taking root elsewhere in life and voila, we've been silent for four days past the end of Wimbledon. 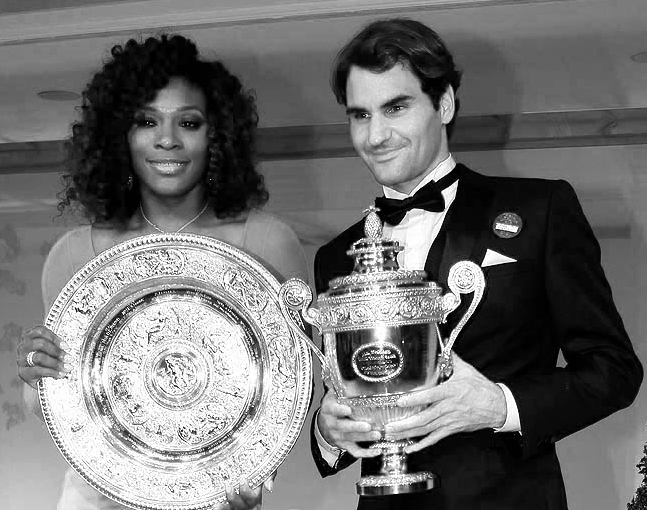 Let's start our penance here: First, since we've already feted ladies' champion Serena Williams, a hearty congrats to 2012 and seven time men's champion Roger Federer. To say Serena and Roger emerging as the champions was unexpected, would be insulting; but we would say if you picked BOTH to win at SW19 this year, you're either in the minority or a time machine. AR: Time is an enemy for both, already over 30. Roger hasn’t won a major since 2010. Same year that Serena last finished a season cradling a Slam. Who is more likely to win another one? That’s a case of roommates. In Roger’s apartment two residents have been paying the bills for months while in Serena’s house each day different people come in. If Serena wants to choose a room, she has a more legitimate chance to succeed. What I mean is, Serena can play toe-to-toe with the leading players of her tour on a given moment (including Slams). Not sure if Roger can pass consecutive best-of-five tests against the current top dogs. I go with Serena. CO: I'll take Serena. Roger can do it though, and I have a feeling that he's going to have his shot in New York later this year when Nadal and Djokovic are running on fumes. But Serena is still arguably the best player in the game. She just needs to get that mental edge back. She needs to avoid those confidence-shattering walkabouts that have opened doors for lesser opponents. For instance, how did she lose that second set against Razzano in Paris? Now that she's lost a few of those types of matches, she should be more ready to be a frontrunner than ever before. I think she'll get that elusive No. 14 this year. VE: Roger’s still No. 2 or 3 in the world, depending on when you read this. He’s still playing a full schedule and upsets happen, right? Serena is still a helluva player and she’s been close too, but she’s also faced some puzzling upsets while Federer is largely invincible until he gets to Nadal or Djokovic. Both are clearly capable, but I’m going to give the slight edge to Federer. LMB: That’s a tough one! You can never write off Roger Federer, but with the dominance and heavy competition of Rafael Nadal and Novak Djokovic, I am inclined to think that Serena Williams is more likely to clinch another Grand Slam title first. The ATP top 5 have been quite consistent and solid over the last three years, whereas there has been a lot more movement at the top of the WTA rankings. There you have it, none of us were wrong; but none of us bucked the assignment and said, of course both WILL win another major. As we always say, that's sports, that's why we watch and they are in fact, the greatest shows on Earth. It is appropriate for anybody who would like to manage their own hair inside a implies that is actually correct. brazilian hair 1 merely needs to uncover a highly effective beauty salon with this treatment. Steps to check out Within blowouts, numerous steps tend to be with the beautician that's expert: • First of all, these people thoroughly clean their own client’s locks along with specific clean that is specially-formulated concerning this sort hair remedy. brazilian hair sale following, these people split hair within 2 components as well as utilize the right remedy within every component. brazilian hair uk action that's Following would be to blowdry hair and offers a good appartment metal that could seal laser hair removal in your hair. Within action that's following, these people utilize the locks masque related to locks getting rid of serum which remedy used within.